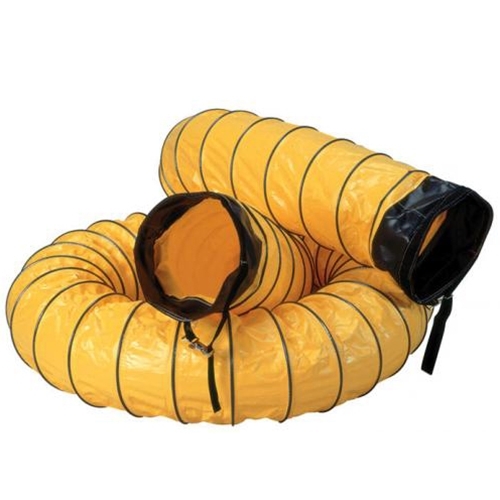 Air Systems International 6 foot, 8 inch diameter standard yellow ducting and accessories will help you ensure that your ventilation set up is working properly, and that you don’t have to break the bank. For the last 30 years, Air Systems has provided our industry with quality equipment and supplies at a great price and with industry regulatory and informational resources to allow you to make the correct purchases the first time around. Proper ducting and ventilation set up is important for every job site, and choosing tough, quality supplies only means your investment goes further. Each and every run of ducting by Air Systems international is built using quality materials and expert design – Delivering the results you need while lasting for the long haul. Yellow standard ducting hose is made of a vinyl polyester blend and is reinforced internally with a steel wire hoop that has a 5 inch pitch. The external wear strips come standard for all 8 inch diameter ducting, and Air Systems can also provide completely custom orders. Each end of the SVH-6 has a 6 inch attachment cuff that is 8 3/8 inches with adjustable straps. Ducting connectors, alarms, carriers and transition pieces are also available for purchase, in a multitude of sizes as well as completely customized sizes. Browse all options for standard and conductive ducting, as well as a wide variety of other ventilation equipment at Intech Equipment and Supply. Air Systems International also has a large library of industry and regulatory information, and with almost 3 decades of experience their pros are well versed and can get you up and running in no time. Order online day and night or call our experts for information and assistance with custom orders. Shop Air Systems International and other industry leading manufacturers for ventilation and PPE Equipment today!